convenient, relaxed setting of your home! There is no better place to get to know your cats, than observing them in their most comfortable setting possible - your home. This provides a more realistic insight into your cat's health which in turn reduces diagnostic costs. Your cat always gets my undivided attention something that may not otherwise be possible in a traditional veterinary clinic setting. Communication is key to providing excellent veterinary medicine. My home visit appointments allow plenty of time after the examination to explain what’s going on, answer any questions or concerns, and provide you with choices. You can rest assured knowing that I will discuss different treatment options so that you can make informed decisions about your cat’s health that are right for you and your cat's own personal situation. I promise to provide the ultimate cat friendly veterinary experience possible. I use my natural cattitude and Feliway on my uniform and equipment to make sure cats feel at ease. There's nothing like my welcome supply of treats to encourage a positive experience either! Detect diseases earlier, when treatment is far more likely to be successful. ​​More accurate readings for vital parameters like heart rate, blood pressure and blood glucose (sugar) levels. Surgery waiting rooms are a thing of the past - sit in the comfort of your home and put the kettle on... "tea, white with one" for me please! No need to locate (and de-spider) that elusive carry cage! 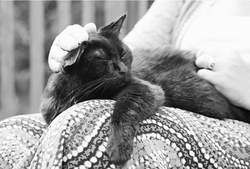 I aim to get to know your cat almost as well as you do so I have designed my own Getting to Know Your Cat Questionnaire which you have the option to download and complete at the end of the registration process. I can learn all about your cat's individual needs, likes/dislikes and then tailor my advice and support to meet each of your needs. It's also a handy spot to find new products or services for cats as well as lending a helping hand when you have LOST or FOUND or been visited by a stray cat. You may be pleasantly surprised by what can be achieved in your home!